A cup of Roast House Ride the Edge nitro coffee at Beautiful Grounds. Barely visible, the caramel-colored bubbles slide in cascading waves down the sides of a translucent plastic cup. A hint of creamy foam rises to the surface of the rich, chocolatey brown liquid like the fizzy head of a stout or porter-style beer. But there's no alcohol present, and in place of the carbon dioxide added to beer, this concoction is infused with another naturally occurring gas: nitrogen. Nitro coffee, as it's been dubbed, is the latest experiment in the fast-growing cold-brew coffee movement. Adding nitrogen gas results in a surprising smoothness, and less acidity than a standard cold brew. 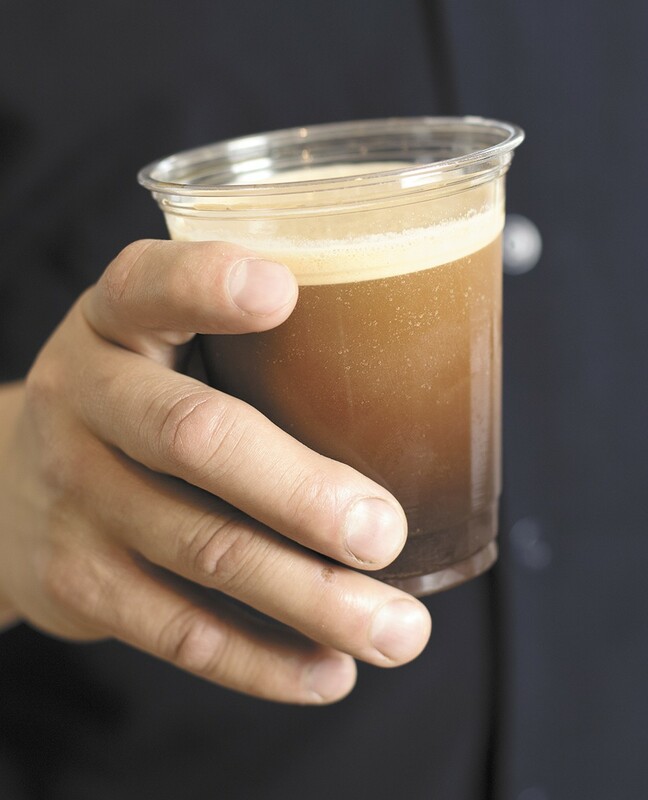 In appearance, nitro coffee closely resembles Guinness beer, famously served on a nitrogen tap. 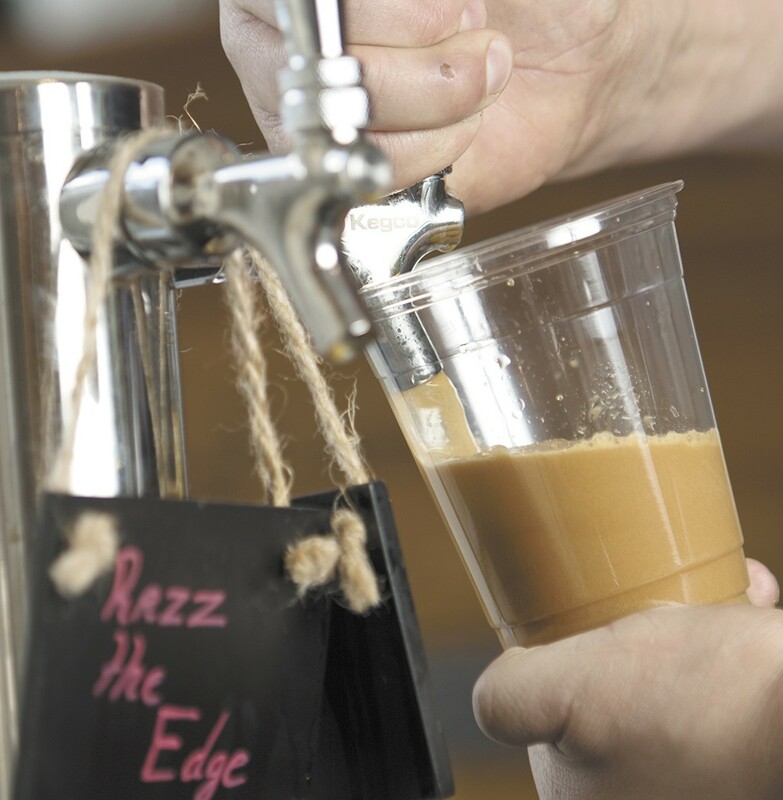 While the warm-weather beverage (it's currently served as a variant of cold-brew coffee) has taken hold in larger, metro areas like Seattle, Portland, Washington, D.C., and Austin, Texas, a few Spokane coffee brewers are jumping in as the region's early nitro coffee chemists. At Beautiful Grounds, a combo beauty bar and espresso on the mezzanine of the Liberty Building, above Auntie's Bookstore, nitro coffee hit the taps at the beginning of the month. "It's not just nitro coffee," says Joe Johnson, co-owner and barista at Beautiful Grounds. "It's microbrew coffee. It's the offshoot of craft beer." Johnson exclusively brews with beans from local roasting company Roast House Coffee, and his nitro-infused cold brews rotate between Roast House's F-Bomb (his most popular), Ride the Edge, Batz and a custom Beautiful Grounds blend. The chemistry of nitrogen-infused coffee, and how the gas creates a smoother and less acidic flavor profile, is a result of nitrogen being denser and mostly insoluble in liquid. Thus the gas bubbles, smaller than CO2 bubbles, floating next to the coffee's water molecules, create the sensation of a smoother texture in one's mouth. A lower acidity means a less bitter taste and allows flavor notes to surface that otherwise wouldn't. This trait is also why some fans of the drink say it tastes sweeter and creamier than black coffee. Because of these variations in flavor, texture and acidity, Johnson spent about six months experimenting to find the perfect brewing method. "Everyone is making stouts and coffee beers, and I did some research online and came across nitro coffee," he explains. "I liked the concept, but not the method, so I talked to various brewers and roasters and developed my own way." He won't disclose the details of his brewing method, but says he has 12 years of barista experience behind him and avid home beer brewers in the family. Timing is critical, and Johnson's brewing process takes about a week for each batch. Now that he's pouring from two 5-gallon kegs on tap at Beautiful Grounds, including filling growlers for regular customers, Johnson is brewing up to 100 gallons a week. In the meantime, he's also working on a collaboration with Chairs Public House to provide nitro coffee for specialty cocktails, like a nitro coffee whiskey and the "limonoffi," a limoncello with the nitro. Beautiful Grounds co-owner Joe Johnson experimented for months to perfect his nitro coffee process. Beautiful Grounds' nitro cold brew is sold to-go ($4/12 oz. and $5/16 oz.) and by the growler ($20) and grunt ($12). Johnson also has come across combinations of nitro coffee in hard ciders, and espresso-inspired desserts. And although some coffee purists would shudder at the idea, don't be afraid to add flavored syrups, cream, milk or sugar to nitro coffee if you're not a fan of the natural taste, Johnson advises. Just remember that the natural flavors aren't as bitter as traditional drip or cold brew, so a little goes a long way. With Portland-based Stumptown Coffee Roasters recently releasing its nitro coffee in a can (we're told it'll be more widely distributed in October; for now you can only get it at select Stumptown cafés in the Seattle, Portland and Los Angeles areas) and Starbucks starting to serve its cold brewed coffee (no nitro yet) in some of its retail stores, the nitrogen-infused coffee trend seems to be on the edge of critical mass. While Johnson is maybe the first business owner in Spokane to begin pouring nitro-infused coffee, downtown's Boots Bakery & Lounge has also arrived early to the trend, offering its version of nitro starting a few weeks ago.